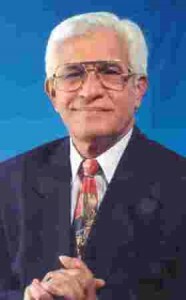 Mr. Basdeo Panday speech at the first anniversary of CLUB 88 and the unveiling of the symbol and the UNC Party at the Declaration of Aranguez on October 16, 1988. Today we celebrate two major events. The first anniversary of CLUB 88 and the unveiling of the symbol of the Party of citizens at the Declaration of Aranguez on October 16, 1988. It is said that Almighty God moves in mysterious ways His wonders to perform. It is also said that those whom the gods wish to destroy they first make mad. No one dreamed that when Robinson made that, devastating move on February 8, 1988 to break up the NAR and abandoned the quest for national unity that the population would hold fast to its dream and pursue with unrelenting zeal the goal of unity. For many decades we have had a dream, a dream of establishing a society that is found on love, not hate, and suspicion and antagonism; a society in which we end that debilitating yoke of alienation that like an albatross around our multiracial necks has prevented us from, creat­ing a truly happy and prosperous nation, a society in which there is equity and equality for all. On the 15 December, 1986 many of us thought that we had reached the top of the mountain and were about to look down on the green pastures of truth, honesty, fairness and equality. But behold, the dream turned into a nightmare when the shepherd which we appointed to lead us to the promised land turned upon the flock and ravaged the lambs. But the Lord was at hand. He was putting to the crucial test those who so gladly spoke of an equitable society and those who had a hidden agenda of lust for office and power. He was separating the wheat from the chaff, the sheep from the goats, the men from the boys, the pa­triots from the traitors. “This country will divide, but not along the lines that Robinson wants it to divide. It will divide when those who are for change will be on one side and those against change will be on the other side. That change has come as predicted”. When CLUB 88 was formed a year ago its purpose and function was to try to pull the NAR back on the rails. No one intended that it would emerge into a new party. Almighty God moves in mysterious ways. All we did was do our duty as we saw it from day to day. We did it without hate, without malice, but with, a resolute determination not to be seduced by trappings of office in the pursuit of our duties. In 1986 we thought we had seen a ray of hope. It turned out to be a ray of despair, a robbing son, an Arthur who thought he was a King. A ray that turned out to be a mound. Today we display our symbol and name UNC. United – to keep forever in our mind our long sought dream. National – to indicate that unity is in the interest of the nation – all its peoples. Congress – to reaffirm and reassess our commitment to consultation and’ participation by all our peoples in the decision – making processes that affect our lives, and in a share of the national patrimony. Today the new dawn is about to break. On April 30, 1989 the sun shall rise above the Trinity Hills, and we shall complete the final phase of our journey which our ancestors began more than a century ago. As the sun rises so does a song rise in our hearts. A song of love and hope. A song of fire and courage. A song of indivisible will and determination. It is a song of joy. . A song of victory. Fait justita dum cadeo cedit. Long live my country. May God bless them both.